Whovians will be jumping for joy with confirmation that the ABC will continue its early morning premieres of Doctor Who, in sync with UK audiences for the entire season. It will also continue iview screenings on Sundays ahead of the primetime screenings. 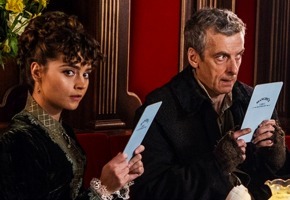 The numbers were good for ABC yesterday with 148,000 watching “Deep Breath” at 4:50am and a further 710,000 in the evening. There were another 62,000 plays via ABC iview. In the UK Peter Capaldi’s debut attracted 6.8 million viewers, down on the 8 million who watched Matt Smith’s debut in 2010. Episode 2 “Into the Dalek” will be screened early this Sunday 31 August and again at 7.40pm on ABC and via iview during the day. ABC2 also has a replay at 7.30pm on following Saturday night. This must be the only show on TV that is truly “fast-tracked” (simulcast, other than special events)!!! That says just how important the show is around the world. Thank you ABC!!!!! Loved the first episode for Capaldi and can’t wait for Robots Of Sherwood and Listen in the next few weeks!!! Lost sleep is a small price to pay for this privilege. Thank you so much ABC! I’ll be with you every Sunday morning for the next 3 months! This is the best TV news ever and hopefully the germination of other similar live airings for popular TV shows. Fabulous news! ABC leading the way yet again, commercial networks please take note. Never been happier to be proved wrong! Congrats ABC for giving fans options. Simulcast at 4:50, available all day on iView, and screened again at 7:40. For those that wanted a different experience it was even shown in cinemas and made $629,219 finishing in 6th spot for the week. This allowed people to watch it immediately, or when they wanted to, and how they wanted to (tv, online, cinema). This is exactly what people are asking for. No one would have needed to pirate it. People even paid to see it in cinemas. Compare this to the commercial networks crying foul, when it is them who don’t fast-track, don’t start on time, and have lousy catch up services therefore forcing people to other options. ABC gave people every option. I was able to watch Dr Who using Apple Tv via iView. Wife will be happy with a sleep in while boys watch the doctor. Four year old thought the Tardis being spat out by a T. rex was a great start yesterday, bit confused about new face. I was hoping this would happen, might not get up at 5am but I’ll set the PVR and watch it first thing, much better that sitting at a cold desk and watching iView, if only Apple TV had access to iView and it wouldn’t matter. Excellent! I was disappointed to see there was no simulcast in the guide for next Sunday, but this change is very welcome.